Reading Mr Malcolm Muggeridge’s brilliant and depressing book, The Thirties, I thought of a rather cruel trick I once played on a wasp. He was sucking jam on my plate, and I cut him in half. He paid no attention, merely went on with his meal, while a tiny stream of jam trickled out of his severed œsophagus. Only when he tried to fly away did he grasp the dreadful thing that had happened to him. It is the same with modern man. The thing that has been cut away is his soul, and there was a period — twenty years, perhaps — during which he did not notice it. It was absolutely necessary that the soul should be cut away. Religious belief, in the form in which we had known it, had to be abandoned. By the nineteenth century it was already in essence a lie, a semi-conscious device for keeping the rich rich and the poor poor. The poor were to be contented with their poverty, because it would all be made up to them in the world beyound the grave, usually pictured as something mid-way between Kew gardens and a jeweller’s shop. Ten thousand a year for me, two pounds a week for you, but we are all the children of God. And through the whole fabric of capitalist society there ran a similar lie, which it was absolutely necessary to rip out. It is as though in the space of ten years we had slid back into the Stone Age. Human types supposedly extinct for centuries, the dancing dervish, the robber chieftain, the Grand Inquisitor, have suddenly reappeared, not as inmates of lunatic asylums, but as the masters of the world. Mechanization and a collective economy seemingly aren’t enough. By themselves they lead merely to the nightmare we are now enduring: endless war and endless underfeeding for the sake of war, slave populations toiling behind barbed wire, women dragged shrieking to the block, cork-lined cellars where the executioner blows your brains out from behind. So it appears that amputation of the soul isn’t just a simple surgical job, like having your appendix out. The wound has a tendency to go septic. The gist of Mr Muggeridge’s book is contained in two texts from Ecclesiastes: ‘Vanity of vanities, saith the preacher; all is vanity’ and ‘Fear God, and keep His comandments: for this is the whole duty of man’. It is a viewpoint that has gained a lot of ground lately, among people who would have laughed at it only a few years ago. We are living in a nightmare precisely because we have tried to set up an earthly paradise. We have believed in ‘progress’. Trusted to human leadership, rendered unto Caesar the things that are God’s — that approximately is the line of thought. Unfortunately Mr Muggeridge shows no sign of believing in God himself. Or at least he seems to take it for granted that this belief is vanishing from the human mind. There is not much doubt that he is right there, and if one assumes that no sanction can ever be effective except the supernatural one, it is clear what follows. There is no wisdom except in the fear of God; but nobody fears God; there fore there is no wisdom. Man’s history reduces itself to the rise and fall of material civilizations, one Tower of Babal after another. In that case we can be pretty certain what is ahead of us. Wars and yet more wars, revolutions and counter-revolutions, Hitlers and super-Hitlers — and so downwards into abysses which are horrible to contemplate, though I rather suspect Mr Muggeridge of enjoying the prospect. Mr Aldous Huxley’s Brave New World was a good caricature of the hedonistic Utopia, the kind of thing that seemed possible and even imminent before Hitler appeared, but it had no relation to the actual future. What we are moving towards at this moment is something more like the Spanish Inquisition, and probably far worse, thanks to the radio and the secret police. There is very little chance of escaping it unless we can reinstate the belief in human brotherhood without the need for a ‘next world’ to give it meaning. It is this that leads innocent people like the Dean of Canterbury to imagine that they have discovered true Christianity in Soviet Russia. No doubt they are only the dupes of propaganda, but what makes them so willing to be deceived is their knowledge that the Kingdom of Heaven has somehow got to be brought on to the surface of the earth. We have not to be the children of God, even though the God of the Prayer Book no longer exists. The very people who have dynamited our civilization have sometimes been aware of this, Marx’s famous saying that ‘religion is the opium of the people’ is habitually wrenched out of its context and given a meaning subtly but appreciably different from the one he gave it. Marx did not say, at any rate in that place, that religion is merely a dope handed out from above; he said that it is something the people create for themselves to supply a need that he recognized to be a real one. ‘Religion is the sigh of the soul in a soulless world. Religion is the opium of the people.’ What is he saying except that man does not live by bread alone, that hatred is not enough, that a world worth living in cannot be founded on ‘realism’ and machine-guns? If he had foreseen how great his intellectual influence would be, perhaps he would have said it more often and more loudly. 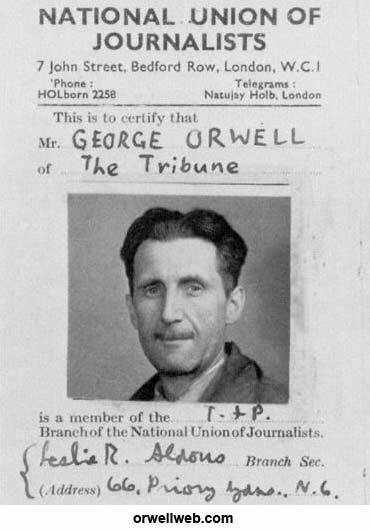 You are currently browsing the archives for the George Orwell category.